I really don't know where the time goes, one minute it was Thursday and I had loads of time to visit the desks and the next minute it was Wednesday again! Apologies for not getting around too many last week but the computer was playing up and on top of that I was prepping samples for Sam's TV shows on Ideal World today. Anyhoo, what does my desk look like today...it's actually quite organised (by my standards!!). I'm putting together one of the projects for the cruise in November (a 3d pop up card). I'll be running 20 workshops and I need to prep 50 of each project so I thought I ought to get started! 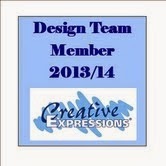 It's also my day to post on the Creative Studios design team blog today with a step by step project. I decided to use one of the cards I made for the TV show (I think it's on at 11 and 3). I've used Sam's new A6 Holly background stamp and also stamps from the new silhouette Poinsettia A5 stamp set. I won't repeat the step by step on here but pop over to the other blog if you'd like to see how it was made. And so to finish....not a travel photo but a picture of the clay owl I made at a workshop at the Larmer Tree Music Festival! He now lives outside my studio and looks quite at home there! I nothing else, it's made me decide that I'd better stick to paper and not clay! Hope you all have a great week and thanks for visiting and leaving comments. Hopefully I'll do better this week and visit more of you! I LOVE that card. i don't have any of those stamps or dies, but I can tell this is one special card. It's also inspirational. Good luck going live. Happy WOYWW from #1. I love the owl, he is lovely. Your card is so gorgeous and love your clay owl! good luck getting all your samples made! I think your owl is a cutie! Your card is stunning. Brave you to teach so many classes and to have everything ready to go for them! Beautiful card, you are sure going to be busy prepping all those cards. Thanks for visiting and have a great week. How exciting! Going on a craft cruise!! It will be awesome for sure!! I love your card too and the owl is amazing! You are very talented!! and yes, the class is online! I feel the same way! I am always playing catch up with WOYWW. As much as it inspires me, some weeks I struggle to make all of my rounds. So I am trying to manage expectations to ease my guilt. I love the Christmas card very pretty. And your owl is amazing. Have a blessed day and remember, one desk at a time and keep it fun. Thanks for visiting my desk today. Your cute little birdies look well dressed for winter!! I know they will be adorable on your 3D card! That owl is fabulous! You have crafted a bird with attitude! Love it! You are such a busy lady, love both the cards, and your owl with his collar and tie! Your card is gorgeous and the one in the first photo with the birds is fab. I love all those birds but I have to say your owl is the cutest darn thing out. He's gorgeous. Awww, your owl is kinda cute. :-) Your Christmas card is lovely! Thanks for visiting my desk and have a great week! Beauty is in the eye of the beholder! I think the owl is rather lovely, full of mischief! I know you've got to get ahead with your cruise prep, but I can't even think of Chr.....s at the moment!! Love the owl, he is gorgeous, does he miss you when you go on cruises? See you next Wednesday, only 6 days away. Thanks for visiting yesterday Pam, much appreciated. Love the 'C' card, great stamp and a pretty background. How lucky are you, cruising and crafting, can't be bad. I have to I totally love the owl :-) and the card is a fun looking project.. but man make a set of 50 for people to work on, that's a lot. I've been on several cruises and love them. How cool to get to teach on one!!! Way to go! What cruise line is it? That's a lot of prep work. The owl looks great to me. I'd say you should dabble in clay a bit more! Thank you for visiting me already. I knew it probably wouldn't be until today that I managed time to get around to desks. Oh no kidding, Pam, the time is flying--don't blink! Having watched 'The Cruise' programme on tv lately I wish I was coming with you ..... I'm very good at making tea and coffee!!!! Thanks for stopping by! Your Christmas card is lovely, but, hey, that owl is fabulous! I am convinced these weeks are going quicker. Never mind the kids will soon be back in school and Halloween will soon be with us! Love your owl. He is gorgeous and even better cos you created him!